Last week I came across a weird problem. 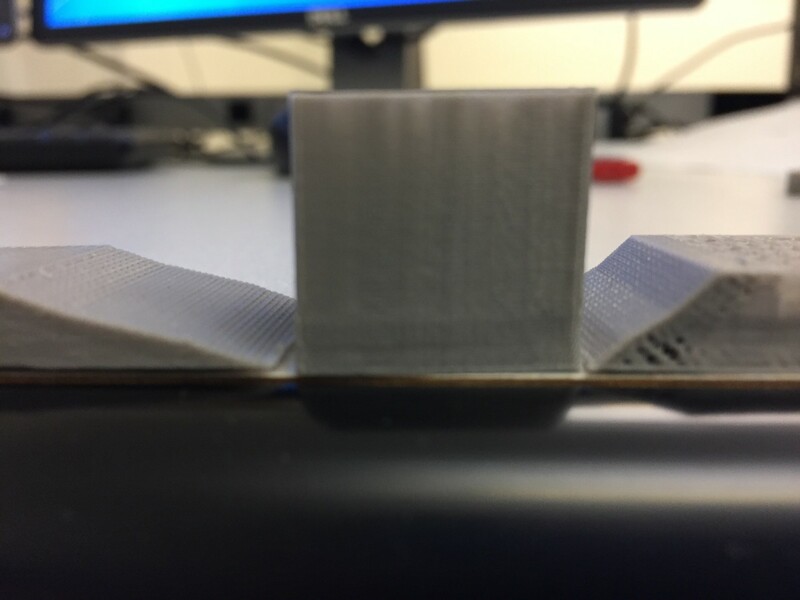 Every time the model I printed had several layers compressed and it always happened on the same height, which made the height lower than designed and made the slope of the ramp changes. As you can see in the pictures I attached. But the gcode is correct and I also didn't change anything in CAD model, so I guess there are some bugs in arduino firmware. I'm wondering if anyone have any idea on this problem? How did you print the good one? I can only think of 2 reasons. 2. You are loosing steps at that height (friction?) 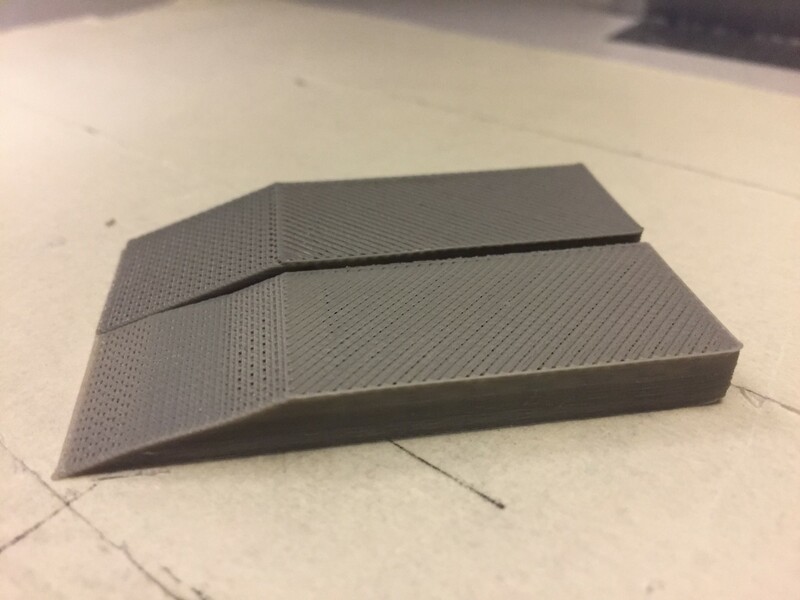 so layer switches are not as high as steps would suggest. Slower acceleration/z speed might help here. No, I don't think it's a mechanical problem since I just tried to print another piece with slower speed, but the problem still exists. And also I tried to raise the print bed but the pieces I got also had the same problem with the compressed part at the same height. I'm thinking there is something wrong with the arduino translates the g-code into the command that moves the printer. How did you print with slower speed? Did you reduce z max speed? I don't think xy speed for printing which you set in slicers matters here and for z some slicers rely on firmware reducing speed to a healthy limit. The code does not depend on z so it behaves always the same. Only external influences can change what happens. E.g. a z max endstop triggering could stop a z move before finished. I suggest to make some measurements for different Z to see where what happens. Lets say problem starts a 1mm and ends at 5mm go z=0 and then up 1mm, measure real distance, do this then z=0 -> 2 .. 10 and compare results. Also hear if you hear some lost steps. It might be ok going from 0 to target but fail to go from1 to 1.1mm - then acceleration in that area looses steps. and I found that between about 2mm to 4mm the extruder is moving shorter distance than it should be. I think it will also happen if I reduce the height of z max length. And there is no weird sound which indicates any slide. I'm still wondering there is something wrong in the arduino firmware. Is there anyway I can reinstall the program in arduino in order to fix this problem? Thank you. Sure you can install a new firmware with the Arduino IDE. From your question I assume you bought a assembled printer with preinstalled firmware? Ask your vendor for the sources so you see the settings. Without this it is hard to say what to enter as it requires some knowledge, but since most firmwares are open source he must offer them for download. BTW: What firmware are you using? M115 should show the required informations in log. Yes, it's an assembled printer with preinstalled firmware. I searched for the zego firmware for a while but didn't get much information online actually. But I did see there are some files related to arduino in the link above. Not sure how to do it though. That link is our plain github repository. It contains the firmware in all versions published but no configurations for the printer you have. So you would at least require a configuration.h from zego to do so. But I'm sure it does not miss sending steps. Some drivers need a longer high signal but that would not vary with z so I do not think it's the problem. also seem unlikely. Because I have moved up the print bed the compressed part also exists on the same height. And I slow down the print speed by reduce the feedrate in manual control which reduce the speed for xyz. But it didn't help anything. What is your z change per rotation? At a height where it works you could also mark 180° so you have more markers then test in error region. One last thing is make sure you have distortion correction disabled. (G33 R0 in newer versions). But distortion correction works from z=0 and not starting somewhere higher.